Bolzern et al. 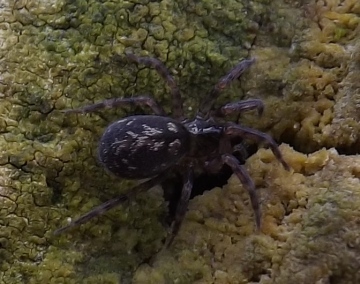 (2013) proposed that Tegenaria agrestis should be placed in a new genus, Eratigena (together with T. picta, T. atrica, T. saeva and T. gigantea amongst British spiders). Here the genus Tegenaria, is retained until the SRS master list is updated. First recorded in Britain from Wilverley Plain, Hampshire in 1949, this species has colonised northwards over the last half century (Merrett 1979). It now has a wide but patchy Distribution: through much of England and Wales, and is colonising Scotland (e.g. Stewart 1987). Elsewhere in Europe it is widespread, extending into Russia, Ukraine and Kirghizia (Maurer 1992). This species was introduced into the Pacific North-west region of North America in the early 1900s. Tegenaria agrestis in Britain is usually found among sparse grassy vegetation and under stones, particularly on waste ground (e.g. in the centre of cities) and alongside railway tracks. The sheet web extends from the retreat and is supported by vegetation. The egg-sac is a multi-layered structure, one layer of which is often composed of mud and other debris (possibly as a device to deter ant predation). Although not normally a house spider in Europe, this habitat is mentioned by De Blauwe & Baert (1981) for the species in Belgium and it has occurred regularly in a house in Bedfordshire (I. Dawson, pers. comm.). In North America, T. agrestis is very much associated with houses and their environs, commonly frequenting wood piles, garages and spaces beneath buildings (Akre & Myhre 1991). Here a number of serious spider bites have been wrongly attributed to T. agrestis (Vetter & Isbister 2008). Adults of both sexes are found mainly in late summer and autumn. A successful and colonising species. Akre, R. D. & Myhre, E. A. 1991. Biology and medical importance of the aggressive house spider, Tegenaria agrestis, in the Pacific Northwest. Melanderia 47: 1–30. De Blauwe, R. & Baert, L. 1981. Catalogue des araignées de Belgique. Bull. Inst. r. Sci. nat. Belg. 53: 1–37. Merrett, P. 1979. Changes in the distribution of British spiders and recent advances in knowledge of distribution. Bull. Br. arachnol. Soc. 4: 366–376. Account last edited by Geoff Oxford at 15:58 on Fri 22nd Jun 2018.